After discussing the idea with the world-renowned chef, 495 Productions reached out to the rapper, but when they called him, he had already known about the show through Stewart. “They really are friends,” says Salsano. “It’s such an honor working with them.” Salsano relates the mega-stars to those on another one of her shows, CNBC’s Blue Collar Millionaires, by expressing how they started out just like every other aspiring blue collar worker: as entrepreneurs. “Even now, at this stage of their careers, they don’t take it for granted,” she adds. Martha & Snoop’s Potluck Dinner Party is the number one rated non-sports cable program in its time period with over three million viewers after only the second episode was released. Plus, it’s already been renewed for a second season. Salsano believes that the reason why the reality TV show is such a hit is because the duo makes the show extremely fun-loving and humorous for people of all ages. She adds that the show has an underlying message of, “Come on, everyone — knock it off. We can all get along.” The renowned rapper and famous chef continue to cross generations and demographics with their celebrity relationship. People may wonder how they can be friends, but as Salsano explains, “When you look at who they really are as people, you come to realize that they have the same interests and the same sense of humor.” It doesn’t get any simpler than that. It’s no surprise that the reality TV producer loves working on the show. “If Snoop and Martha are on set, I’m on set,” she reveals. “It’s a fun day.” The stars actually have a lot of leeway when it comes to what they want to make in the kitchen. While Stewart makes, well, anything and everything she puts her mind to, Snoop is more of a “home cook” and uses recipes passed down by his mother. As Salsano shares, “He claims his mother always used to tell him, ‘You know what girls like? A man that cooks.’ And from then on, he has been making his signature dishes, like fried shrimp and catfish, for his family and friends.” Great relationship advice from Mamma Snoop! Given her love for the reality TV stars, we had to ask if she ever thinks about doing a Jersey Shore revival. Without skipping a beat, she exclaims, “Like every day! Every show runs its course, but you never know.” We’ve got our fingers crossed! 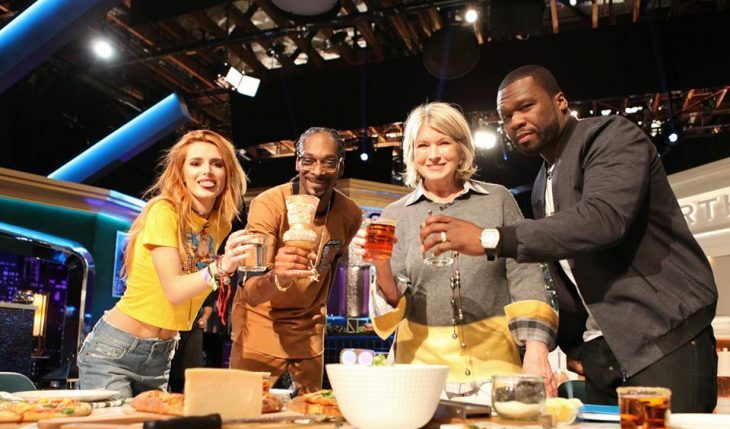 Be sure to tune in to Martha & Snoop’s Potluck Dinner Party on Monday, March 6 on VH1 at 10pm ET. You can keep up with Salsano’s many projects on Twitter @sallyannsalsano!